I have to get this off my chest. I have a strong memory from when I was a kid, probably the 2nd or 3rd grade, standing around in our big kitchen talking with my mother. Somehow, we were discussing jobs. I have no idea why this topic had come up, but I do remember talking about one of my favorite places in town, the Post Office. My Uncle Al worked there. He had been a police officer but then switched careers to work for the Post Office. Everything about the Post Office was great — I loved the building and the large WPA murals, especially the one of John Brown who had lived in my town. I loved looking at the “wanted posters,” and the high counters, and how much like a bank it felt. I loved banks, too. When talking about my Uncle, my mother used the phrase, “Civil Servant,” and I didn’t know what she meant. It’s funny that I remember her saying that phrase. She then told me that if, when I grew up, I took a test and got a job with “The Government,” it would be a “good job.” From what I knew then, a “good job” was one that paid you well and gave you “security.” I thought that meant you didn’t get fired. “The Government” will take care of me? I figured it must be a big deal to become one of these Civil Servants, because you have to take and pass a test. I knew Uncle Al was a smart man. The test part scared me. But my mother assured me I would get a “good paycheck and have insurance.” I remember feeling happy that my mother thought that I could pass this test. I had no idea where one took the test, but I figured she would tell me when I was older. I remember, too, wondering about the insurance part. The only insurance I knew about was the [life] insurance payments my parents made to the man from “The Insurance Company” every month. He drove to our house in a nice car wearing a suit and a smile. My parents had a little payment book and he would fill in a page every time they paid him. They would sit around the kitchen table. I liked him. He gave me and my brother a shiny new penny every time he came. When my mother talked about insurance with “The Government” job, I didn’t know if she was referring to another Insurance Man, but I figured it must be important. I also especially remember thinking it would be nice to work for the Post Office in that fabulous building, just like my Uncle Al. As I reflect on this, I find myself thinking something sad. There have been a few moments during some very difficult times over the years that I have thought, “I’m glad my father/ mother isn’t here now to see this.” I especially thought this after 9/11; my dad, a World War II veteran, died in 1996. I remember feeling strongly that the horrors of that awful day and the ramifications of what happened would have been so overwhelming, so upsetting for him, that I would have had to shield him from them somehow. My mother died several years ago. And today I find myself thinking, with profound sadness, “I am glad my mother isn’t here right now to witness this shutdown.” Many people, including a close family member, work for “The Government.” Someone I know not only has a “good job,” he has a “big job.” But he can neither work nor be paid. My mother’s trust, her faith, her knowledge that “The Government” will take care of you, has been proven false. This shutdown would have rocked my mother to the core. I know it’s rocking me to my core. Kids loved her. Customers loved her. Visitors loved her. I loved her, and so did my dog Snowy, except perhaps when she bit him through the cage after she had kissed him with a lick. The staff loved her, although they wouldn’t be very happy with her when she went for the proverbial jugular, and immediately followed up the attempt of a bite with a cackle that had to make you smile. It took months before I won Ruby’s confidence, but eventually I was able to stroke her soft feathers on the side of her head, and Ruby would close her eyes in relaxation and trust. And I would extend my index finger into the cage and Ruby would hold onto it with her talon and even stand on my finger perch. I couldn’t get too complacent, though; inevitably Ruby would make a move for my finger with her beak, and usually I pulled my hand away just in time, and my clever buddy would cackle. How she loved that game. The first time I held her, she got me but good. I can’t remember if she drew blood, but I learned through conversation with the young and very talented staff that when a macaw bites, instead of tearing your finger away, you push it in, toward the beak. It’s a counter-intuitive movement, but it works. And then Ruby would cackle and I would laugh and she would laugh some more. “What’s your name?” “What’s your name, Ruby?” I asked her. Upon hearing Ruby say “Step up!” a few times, I’d open the door to her cage with the permission of the staff (after insuring the store’s front door was closed and the coast was clear) and insert my arm and hand into the cage. Sometimes Ruby would “step up” on my hand immediately and I’d secure her talons by covering them with my thumb, and withdraw her from the cage. Other times, she would lunge for my finger or hand, testing me, cleverly knowing I showed some fear of her bites. And then she would cackle. This might go on for minutes; Ruby was clearly in charge. Eventually, however, she would perch on my finger and out she’d come. She lunged significantly less when I held her. Sometimes I would sit in a chair and hold her close to me. One time Ruby was sitting on my lap and Snowy was stretched out on the floor next to my chair. Without warning, Ruby hopped off my lap, spread her wings and sailed to the floor. The staff kept her wings clipped, but she was able to glide. Ruby landed in the aisle a few feet in front of me, and my dog ran to her side and quietly stood next to her, protecting her. I walked to them both, knelt down, extended my hand on the floor and Ruby stepped up. Snowy never barked, and Ruby didn’t lunge. I was nervous, but the animals handled the adventure expertly. 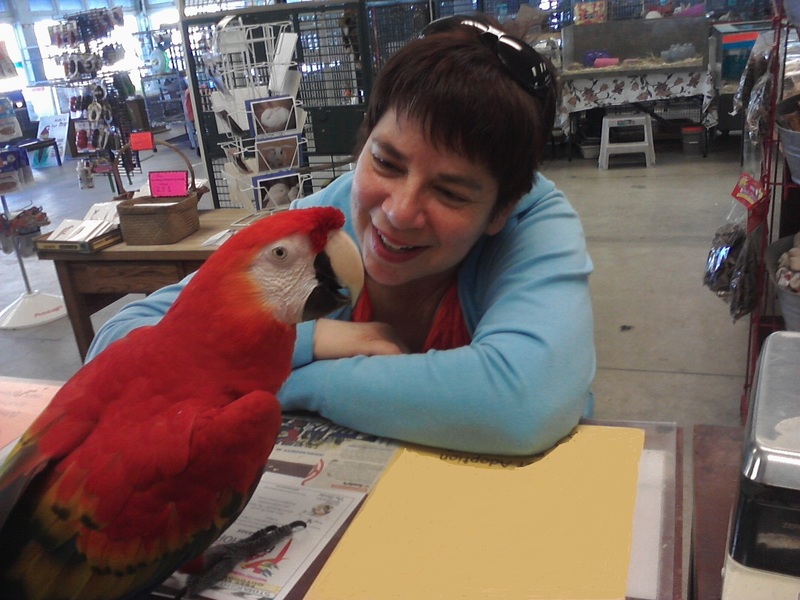 Other times I would hold Ruby for visiting preschool classes and the store’s owner described the behaviors of macaws to the students. My buddy, swinging upside down on my finger, really knew how to work a crowd. I always sang to Ruby. One time while holding her outside, Ruby joined in and sang “La-La-La-La” in different tones. A staff member and I would sing little lines of melody, like a cheer you would hear at a ballgame when the organist plays and at the end of each musical line the crowd chants “Hey!,” except Ruby exclaimed “Woo!” What fun. When she wanted a treat, Ruby would say, “I love you.” The customers always drew near to her when they heard her speak. People in cars and buses waved to us as they passed by while Ruby was perched on my finger in front of the store. When the light turned red at the corner, people in stopped cars frequently lowered their windows to talk to Ruby, or pointed to her so that their kids would see the colorful macaw. When airplanes flew over the store on approach to the nearby airport, she would exclaim, “Hello Ruby!” I’m certain she considered planes kin. Ruby exercised regularly by flapping her wings while I or others held her throughout the day. “Big Eagle! Big Eagle!” we would all chant, and I walked quickly up and down the aisles with my arm held high over my head, and beautiful Ruby, perched on my finger, my thumb covering her talons, would flap her powerful wings over and over, generating a strong breeze. I learned all this when the store’s manager called me to tell me the sad news. I was overcome with emotion, that Ruby had passed, and that the manager wanted me to know the news firsthand. She didn’t want me to read about Ruby’s passing or find out in conversation. I was so grateful and touched. I drove to the store, and was asked if I would like to see my dear friend. As I sat in the back room, holding my dear Ruby, tears fell onto the blanket which enshrouded her. I had to smile, though; Ruby looked beautiful and peaceful, but she had hated blankets. I sang my usual song, “Let me call you sweetheart, I’m in love with you…” to her softly, and stroked her soft feathers, and said a final goodbye to her, as she would have said to me. Andy’s Pet Shop is unique; it is the world’s first pet shop offering 100% rescued pets. Hamsters, guinea pigs, rabbits, mice, rats, doves, pigeons, turtles, snakes, lizards and fish are regularly available. You can adopt cats and dogs and parrots, too, and there may be some in the shop, but as these are happier living in foster homes, they are brought in for adoption fairs. Andy’s mission is as follows: Every pet deserves a good life. We make that happen by adopting out homeless pets, selling quality products, and educating human caretakers. We want to be successful with pet adoptions, so that other pet shops will follow our lead and convert to 100% rescued pets. It’s a special place. Andy’s is located in downtown San Jose, near the De Anza Hotel, and the entrance to Highway 87. Their address is: 51 Notre Dame Avenue, San Jose, CA 95113. (408-297-0840) Andy’s is open daily from 10 a.m. to 8 p.m. They have a large parking lot. You can pop by, or go to http://www.andyspetshop.com/.